In the early ‘60s it is born Cassa Rurale e Artigiana di Sovicille, now, known as Banca Cras - Credito Cooperativo Toscano - Siena. It is inspired by the German model developed at the late 1800s by Friedrich Wilhelm Raiffeisen, to provide an access channel to the small credit, for society’s most vulnerable. The project signed by Il Prisma, started from the branch of Terontola, is proposed to build an ideal scenario to pursue the current objectives of cooperation and mutuality at the service of the territory, taking advantage of the Phygital model. 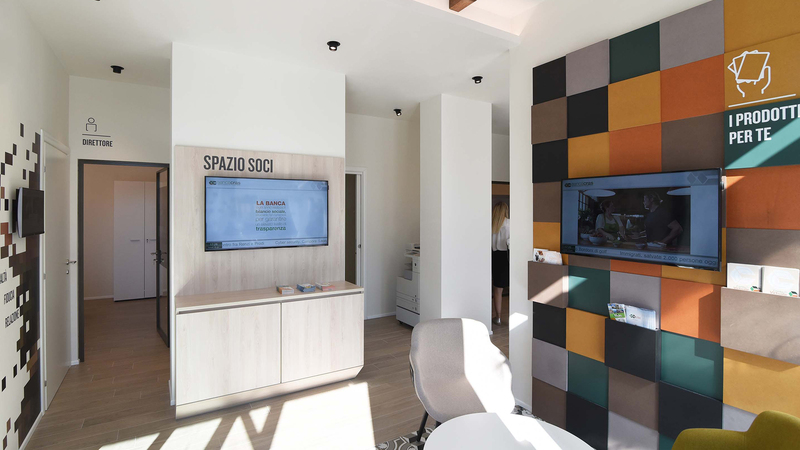 The new design of Banca Cras conveys a meaning of totality that guides a delicate passage; from the traditional banking way 0.2 to one more advanced 2.0, which integrates the physical space to the digital one. The BCC context made by small banking realities locally based, it’s highly connected to the people. This link is metaphorically represented by the Mosaic of values that shows humans perspectives of people and activities, in their own small way contribute to the regional development. 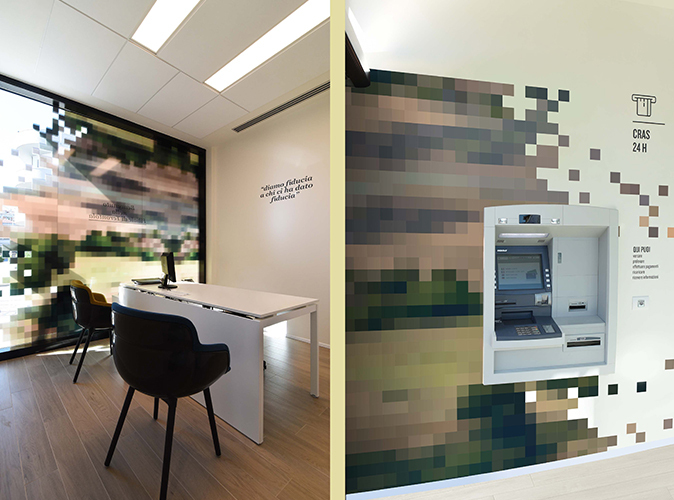 Banca Cras aims to the centrality of the each client, guiding and helping him to become part of the biggest panorama: that of his territory. 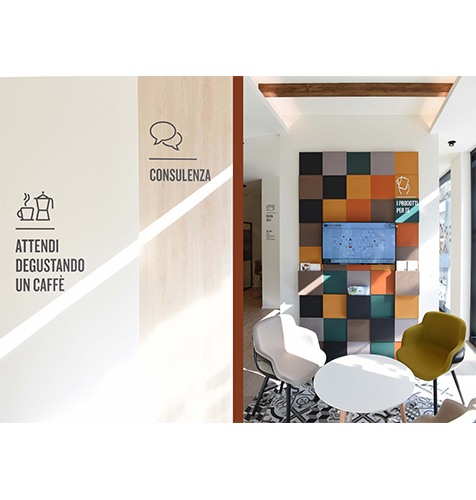 That’s why, the new spaces deal with welcome, informal relationships having a coffee, assistance and education, customer care and digital interactions. 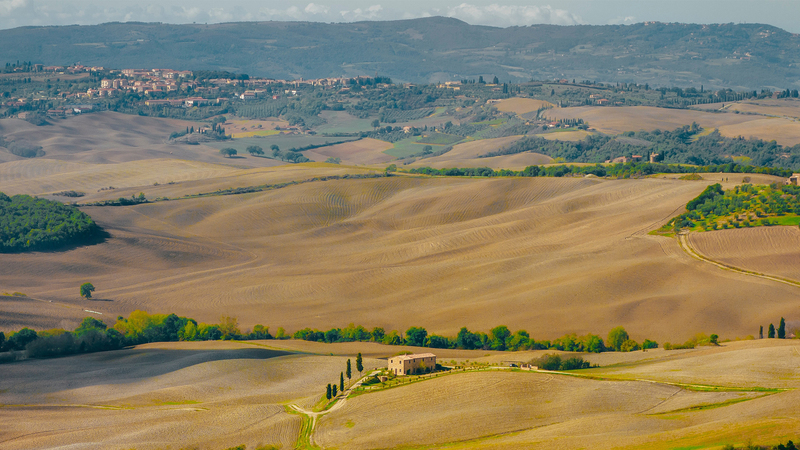 The first branch, inherent in the Tuscan hinterland, is filled with colours and materials that recall to the cypresses lines, ocher and hematite of fields. Ceramics, wood beams, and gray stone tell a reality impregnated with tradition. The innovation thrust promotes the introduction of digital elements aimed to improve the experience, speed it up and more transparent for the clients. It the human relationship is the surplus value, which makes Banca Cras a point of reference. The real innovations does not necessarily imply a full attitude toward an automated and futuristic world, sometimes it simply hides in a balanced union between tradition and digital integration.